Running out of time … what if it weren’t that time were running out? What if you were running? This globe reminded me of the powerful thoughts in Kurt Vonnegut’s Slaughterhouse Five. Vonnegut’s Billy Pilgrim has become “unstuck in time” — but in a larger sense, we are all able to do this, by focusing on certain ideas and events, we make time — our own time — matter differently. So rather than let time run out, I prefer running out of time. On my own power and terms. Become unstuck, make those moments count. 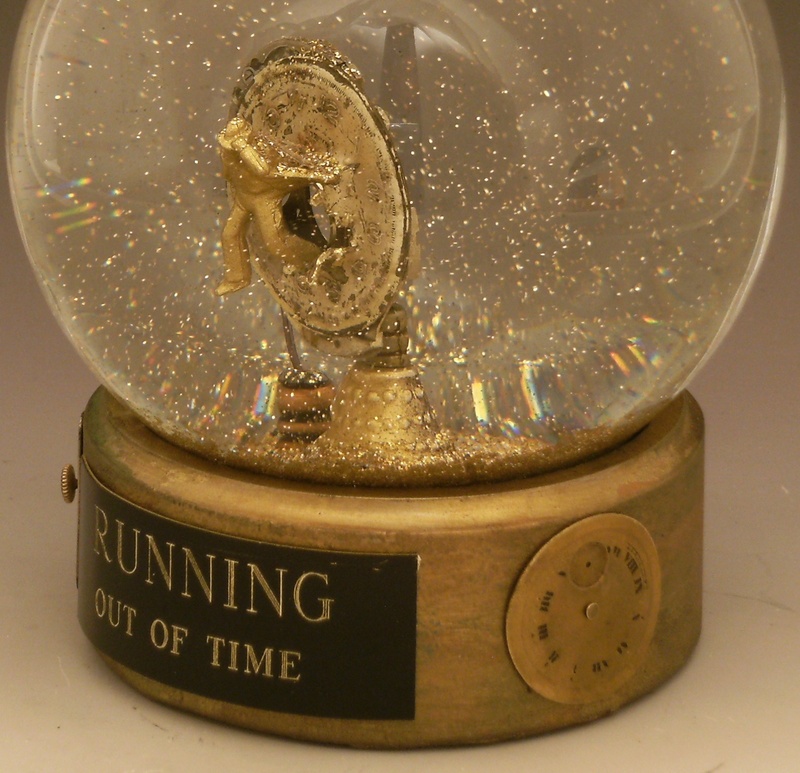 Running Out of Time, one of a kind snow globe/waterglobe with vintage watch faces, and shimmering gold glitter. All images and designs copyright (c) 2015 Camryn Forrest Designs, Denver, Colorado, USA. Ah, Scissorhands, the sound of one hand slicing. A sculpted clay hand in bronze tones wears gold-toned scissors at the ready. When shaken the snow globe explodes with flecks of silvery slivers, and an echo of shimmering iridescent gold dust settles slowly, as though this scissored hand has the ability to slice the atmosphere itself. One of a kind snow globe/sparkle globe, of clay, metal and vintage miniatures. All designs and images are Copyright (c) 2015 Camryn Forrest Designs, Denver, Colorado, USA.